Hop on and experience Washington's monuments by moonlight. 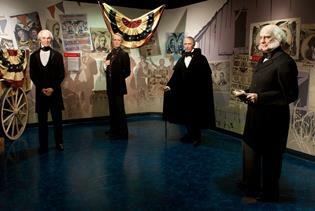 Enjoy famous fun as you rub elbows with U.S. presidents, politicians, celebrities, and more. Less stopping, more sightseeing. All at your own pace. Create your own money-saving adventure. Nothing on land compares to this upscale dinner cruise. Experience Washington DC at night! Everyone should visit our nation’s capital. Learn about the rich history of our country, visit locations steeped in history like the Capitol and White House, or just walk the streets of our forefathers. Our attraction tickets and vacation packages make planning and booking DC vacations a breeze. Tripster Washington D.C. coming soon! There are countless museums to explore, from the Newseum to Madame Tussauds wax museum and everything in between. Or get out in the fresh air and take a cruise on the Potomac. It’s a great way to see the sights. Home to iconic monuments like the Washington Monument and Lincoln Memorial, the National Mall is anchored at one end by the US Capitol and the White House to the north. You have to experience America’s most-visited national park for yourself. And there are always free things to do in Washington DC as well, so let’s pack and go!